I really needed to do a long training run more than I needed to racing a 5k but sometimes you just have to do something a little different. Well actually I have run this race the past 4 years now but it was still a bit different. This was the first year I wouldn't be running with Karla. Our first time was in 2005 as we were training to get me into Boston qualifying shape. We ran several 5k's that Fall trying to get a 5k pr for her while I ran along getting in a good tempo workout. In the process we had a lot of fun and afterwards would go run some extra miles. Then in 2006 she was undergoing her cancer treatments so I just ran with her because of our friendship and then again in 2007 we just went for the fun. Which brings us to this years race. Neither one of us has been running well the past several months so there wouldn't be any pr attempts by either of us. Frank's son Eric was in town visiting so the Werners decided to run the race rather than doing the long run. I decided it would be a good time to test to see just how much I have slowed down since the injuries cut into my training and also see how the legs would hold up to a faster pace. It was a beautiful morning for a race and I arrived an hour early to register and visit with friends from the NCRC. I would be racing in the Team Jersey today which is sponsored by my part-time employer, The Athlete's Foot in CameronVillage. AFter finding the Werners and visting a few minutes, it was time for me to go warm-up. I was encouraged that my legs felt good as I ran an easy mile and then did a few strides to loosen up and get ready for the faster pace to come. Then I made my way over to the starting line. With over 1800 runners I didn't want to get caught behind a bunch of slow starters so I lined up near the front , just behind fast ladies Laura Frey and Katie Eger. 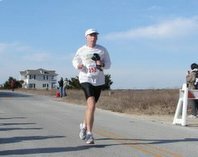 At the gun, I took off at a hard but reasonable pace, or at least I hoped it would be reasonable. I had run just over 22:00 back in May but have only been averaging about 15 miles a week since then and no speedwork. I knew by the half mile that the pace was probably too fast but I was committed so I pushed on. Charles West pulled up beside me and we tried running together for a while. He has really been improving and as we passed the first mile in about 6:55, he began to pull away. Well, they had changed the course this year so instead of a double loop, it would be out , over and back so it was predominatly downhill the first half and uphill coming back. I began slowing as soon as we hit the hills so I just tried to maintain the effort. Eric Werner passed me just before the two mile mark. Eric doesn't run much but is in great shape from biking, including a cross-country trip ove r the summer. Once I made it over the final hill and the course started to flatten out, I tried to pick up the pace several times but there wasn't another gear left. I was slightly disappointed in my time of 23:32, but happy that my effort was consistent and my legs held up to the stress. Yep... just gotta build that base back up. BTW, what do you weigh these days. I read the blurb on the "132 pounds". As a fellow "older runner" who started at age 15 - I weighed 139 when I graduated from high school. I got as high as 159 - while still running. I hope to hit my 40,000th mile this year (not too far off), and am back down to 142 pounds. Changed my diet - cut way back on fats. I'm about 147-148 right now. I dropped down to 138 in 2006 when I was training for my Boston qualifier but went back up to where I am now very quickly when I cut back the miles and intensity. I don't expect to get any over than 145 now with the swimming and biking and extra muscle from my Ironman training. congratulations on the approaching 40K.